Sugar is a sweet, sweet 6-year-old black female, born in March 2000. Sugar came from the Waco Animal Shelter where she was turned in as a stray. Although her right ear is legible, her registration ear has been double tattooed. Sugar was heartworm positive, but has completed her treatment, which started June 6, and now tests heartworm negative five months later! She is one sweet, loving, silly little girl. Sugar is cat tolerant. We have not tested her with little dogs. 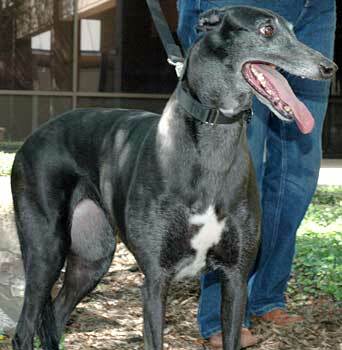 Sugar is a pretty black girl with white patches on her feet and chest. When Sugar first came to GALT, she was a stray and in a pitiful state, full of abrasions and scratches, her coat was dull and lackluster. You would never know looking at her today. Who knew what a pretty girl was under that first impression? Sugar has great potty habits and will go on command but she likes to sniff around a bit first. She rarely has any accidents in the house and is used to a doggie door. When she suspects it is time for a walk, she will get very excited, especially when she sees the leash. She is anxious to go! Over time, she has become quite good on the leash. She still tends to wear out sooner than my other Greyhound, and this is due to a very bad case of heartworms that she had when she was first found. When out on walks, she is a social girl and loves other dogs and will sniff/be sniffed like crazy. 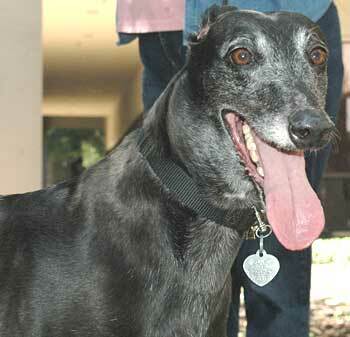 She has taught my spook of a Greyhound to actually play and interact which has been amazing to watch. At times, she can display some bossiness but nothing bad. Sugar willingly crates on command, and will sometimes nap in it with the door open. Her favorite position is the cockroach. It is endearing to see as it shows how far she has come and how confident and good she feels these days. This little girl loves her food and gets fidgety when it gets close to mealtime. She is very discriminating about treats but likes most of them fine. Has to check them out first though! Sugar sleeps in the bedroom on a dog bed. She stays off the furniture, even if invited. Occasionally I have been totally startled out of a sound sleep by her belting out the longest loudest most soulful roooooooooo that you ever heard. Wonder if she is going back to her past having nightmares? I've never heard anything like it; I wish I could get it on tape. Fortunately, she sleeps right on through it and doesn't seem bothered at all. Sugar is good about most grooming and handling but can be a drama queen at times. I'm not sure if that's due to nervousness or just her way of avoiding the whole thing. It will put you off until you realize she is just a great actress! She even seems to know when you're onto her game. Like I said, she is very, very smart. She is a curious girl, and always wants to go somewhere, and has been known to experience some car sickness on longer drives. Sugar loves her stuffies and is quite the performer as she flings them into the air making them land in the funniest places. She's never torn one to pieces yet, which we all appreciate. As her name implies, she is very, very sweet. In the beginning, she used to cower when you reached your hand out to pet her. She will still avoid that at times but comes around quickly when reassured. Trust may be an issue with Sugar but it will come with love and time. Sugar had a lot of issues to get over when we first got her, as she was in bad shape, with heartworms being the biggest issue. I am so happy to see the difference in her now, she obviously feels much better, eats better, and looks so beautiful! It has been a very rewarding experience to see her evolve and become the gorgeous girl she is today. During the day, Sugar is crated with a pet sitter coming in the middle of the day to let the girls out and spend some play time. She is not a chewer, but has tasted ever so gently the corner on a couple of pieces of furniture but I feel that was due to boredom. She will do very well with another dog, in fact she seems to love the companionship. I've had Sugar a lot longer than my previous fosters and you grow very attached. However, the biggest and most remarkable thing is how she has brought my precious heart, spook dog Savannah, out of her shell even further. To see them play and interact together is like a miracle! Finally, Sugar would fit in well with most people who are loving and patient. She's needs to be watched closely for those little signs of what's going on with her, considering her past and the health issues she has had to endure. She loves to play and has a world-class helicopter tail! She would do very well with most other dogs. This is a sweet girl that has come a long way. Looking at her today it is truly hard to believe it is the same scared and trembling stray dog we picked up. 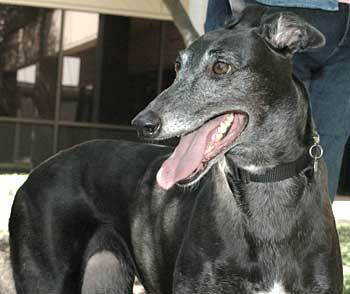 She is a beautiful, social and happy grey with lots of spirit and love to give. She is truly a remarkable girl and it has been a fantastic experience to see her become her true self! Sugar now has one goal, and that is to find her forever home, where she can cockroach on a comfortable bed for the rest of her life.